Preparation time: 15 minutes. Baking time: 20–25 minutes. Preheat oven to 425°F. Place bread crumbs, sesame seeds, and Parmesan cheese in a large zip-top bag and shake gently to combine. In a small bowl, whisk together mayonnaise, salt, garlic powder, cayenne pepper, and poultry seasoning. Using a pastry brush, coat both sides of each piece of chicken with the mayonnaise mixture. 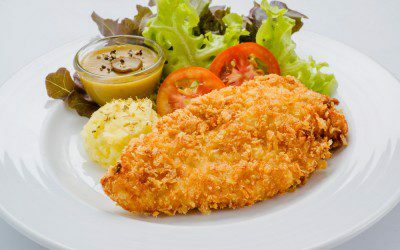 Place chicken, one piece at a time, into the bread crumb mixture in the zip-top bag, seal, and shake to coat chicken well. Transfer chicken to a foil-lined baking sheet coated with cooking spray. Spray chicken evenly with cooking spray. Bake for 20 to 25 minutes or until juices run clear and chicken is no longer pink in the center. Serving size: 1 chicken breast half. Exchanges per serving: 5 very lean meat, 1/2 starch, 1 fat. Carbohydrate choices: 1/2.